Thermolysis, also known as shortwave method, high frequency method, destroys the hair follicle by heat or electrocoagulation. 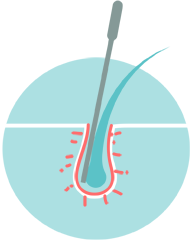 With thermolysis treatment, high frequency radio energy is emitted (mostly) from the tip of the electrolysis needle, first inserted into the hair follicle. The high frequency energy agitates the molecules making up the hair growing cells. This agitation causes the cells to heat, ideally to the point of permanent tissue destruction. This destruction is referred to as electrocoagulation. 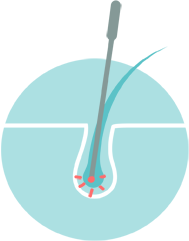 The blend method, also called dual action method, is the combination and simultaneous use of galvanic (this method removes hair through chemical decomposition) and thermolysis techniques. This combination method alleviates the shortcomings of each of the individual techniques, while bolstering their advantages. By doing so, blend electrolysis incorporates the high kill rate associated with the galvanic method along with the swiftness found in thermolysis. Basically, most of the blend’s capacity for destroying the hair growing cells is accomplished by way of chemical decomposition. Cleanse skin well. Applying a numbing cream is desired. Keep area clean and dry, do not apply creams or ointments, avoidavoid chemicals in makeup. Keep area clean and dry. Apply aloe vera, cortisone cream or candela/tea tree oil.